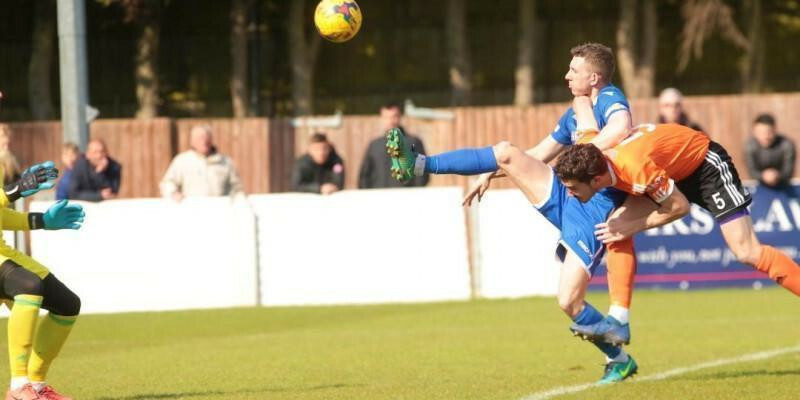 Swindon Supermarine’s superb first season back at the Southern Premier level continued Saturday when they completed the double over Met Police at the Webbswood Stadium. Manager Lee Spalding decided to keep with the exact same 16 that won away at Kings Langley including the 4-3-3 formation which was so effective in Hertfordshire which proved excellent once again on the more open spaces of their home ground. Met Police were missing their top scorer Jack Mazzone and his replacement Bayley Mummery limped off in pre-game warmups forcing Met Police to rejig their plans once again. The promotion chasing visitors started fast and had early chances when Ethan Chislett hit wide, Jonathan Hippolyte’s deflected low effort was saved by Josh Hill and another effort was cleared off the line in a scramble from a corner. The large majority of the first half was a midfield battle with few chances for either side, with the main talking point being a nasty clash of heads between Calvin Dinsley and Luke Robertson which caused Dinsley to receive lengthy treatment including an early change of shirt due to the blood. Stuart Fleetwood had two chances before the half but saw his first effort blocked and his second from distance saved by Berti Schotterl. Marine made a flying start to the second half when Harry Williams got between the Police back four and lobbed Schotterl to score his first goal for the club from a fine Conor McDonagh through ball. Calvin Dinsley, bloodied after an early clash of heads personified the spirit of the home side after receiving three lots of treatment to his head to run the game from the middle of the park with Jamie Edge and Mat Liddiard. Michael Hopkins cleared a deflected effort off the line but it was Marine who had the better of all the second half chances as McDonagh put an effort just wide after great play down the right from Fleetwood. Substitute Bradley Gray curled just wide following more excellent play down the right hand side from Dinsley and Mat Liddiard. Then Stuart Fleetwood was denied by the inside of the post late on as he took a touch from McDonagh’s cross but with Schotterl beaten saw the ball fall to safety off the woodwork.